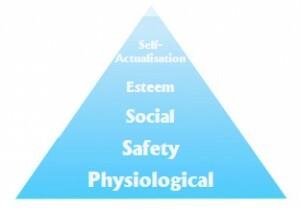 Maslow’s Hierarchy of needs is a framework of human motivation based on his own clinical experiences as a psychiatrist. It is used by modern leaders and executive managers around the world to find means of motivation for employee and workforce management. The basis of this theory is that human beings are motivated by unsatisfied needs and that certain lower factors need to be satisfied before higher needs can. As long as we are motivated to satisfy these cravings, we are moving towards growth and self-actualisation. Satisfying needs is healthy, while preventing gratification makes us sick and causes us to act evilly. For adequate workplace motivation, leaders need to understand the active needs for their employees and help to satisfy them as best they can. The Hierarchy of Needs, as set out in the given pyramid is explained under five categories. Physiological needs are those needs required to sustain life – air, water, food and sleep. Provide employees with breaks for lunch and recuperation and pay salaries that allow workers to buy life’s essentials. Once physiological needs are met, one focuses their attention on ensuring safety and security to free themselves of the threat of physical and emotional harm. Provide employees with a safe working environment, relative job security and freedom from threats. Medical insurance and financial reserves are also factors which could be taken into consideration when working out remuneration packages. The next stage of motivators is the social needs related to interaction with others. Reinforce team dynamics in the workplace to generate a feeling of acceptance, belonging and friendship. After a person feels that they belong, the urge to attain a degree of importance emerges. Motivating esteem needs include self-esteem, accomplishment, self-respect, reputation and recognition. Recognise your employee’s achievements, assign them with important tasks and projects and provide status in the workplace to make them feel valued and appreciated. Awards and promotions are an excellent way of achieving this. Self-actualisation is the summit of Maslow’s motivation theory and is the quest of reaching one’s full potential. Unlike other needs, this one is never fully satisfied; as one grows psychologically there are always new opportunities to continue to grow. Motivators include truth, justice, wisdom and meaning. Self-actualised people have frequent moments of profound happiness and harmony. According to Maslow however, only a small percentage of people reach this level of self-actualisation. Offer challenging and meaningful work assignments which enable innovation, creativity and progress according to long-term goals. Not everyone is motivated by the same needs and at different stages of their lives, different needs will be their biggest motivators. You should recognise each employee’s needs and work to motivate them individually. This may seem like a big task but with a team of happy and satisfied employees, your business is likely to succeed considerably more.